It’s been a year and a half since Hurricane Harvey pummeled through South Texas. Damage lingers and volunteers are still needed to continue restoration. That is why this year’s Spring Break BOUNCE Student Disaster Recovery volunteers focused recovery efforts in the affected area. BOUNCE, a disaster recovery ministry of Texas Baptists, sent 287 middle and high schoolers from 13 Texas Baptist churches to the Golden Triangle to continue recovery efforts. First Baptist Church of Nederland served as the host church for the mission week. "I'm always pleased to see students serve at Spring Break,” said David Scott, director of BOUNCE. “They could have done any number of things during their time off—going to the beach, sleeping late, or just hanging out with friends—but they chose to reflect Christ in the Golden Triangle. They have ministered to people who had great needs. I'm very proud of them and I appreciate their churches for offering them the opportunity to be on mission." 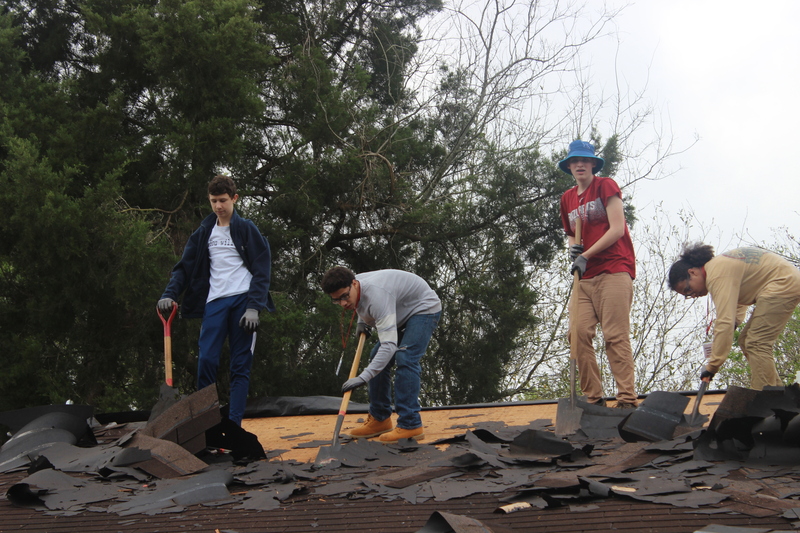 Students served in seven locations in the city and did everything from yard clean-up, drywall removal and installation, painting, roofing, debris repair and trim installation among many other things. Will Hagle, junior high pastor at Mobberly Baptist Church in Longview, led a group of 37 seventh and eighth graders on the trip. Hagle said that God used young people in the Bible and he still does today. “We open the Bible and see teenagers doing a lot of stuff,” he said. “A lot of people think David was probably a teenager when he faced Goliath and the disciples may have been teens and young adults. “Thanks to this opportunity, these kids from Mobberly Baptist are developing a really good understanding of God and I’ve gotten to see them take ownership of the project,” Hagle said, adding that it is important to give kids their own God stories and experiences. “When they go off to college, we see kids fall away from God. Our goal is to get them in places where they can have their own God experiences and be used by God so there is a greater chance that’ll sustain them later on in life,” he continued. The group from Mobberly Baptist worked on a house owned by a young couple with a new baby. The homeowners were able to tell the students about their struggles with Harvey, explaining that the husband had to carry his wife on his shoulders during the storm because the water flooded the house so high she could not hold her head above water. Volunteer efforts have helped get them back on their feet and in their home before the birth of their baby. “The work that BOUNCE sets out for us is meaningful and meets a real need, so the kids get the satisfaction of knowing they are doing something that has a positive impact,” Hagle said. Jared Jochum, from Woodlawn Baptist Church in Austin, took nine students between the ages of 12 and 16. They worked on one house where one of the homeowners was struggling with cancer. In addition to helping with yard work, replacing siding and putting trim in, they were able to do a simple plumbing job that allowed the family to use their washer and dryer. “It was a big deal to them because her illness made it hard for her to have to make trips to the laundromat to do their laundry,” Jochum said. All of the students from Woodlawn who participated were on their first mission trip, so they did not fully know what to expect.